I follow discussions at other blogs and on online civil war forums and again and again I have seen debate about the choices Lincoln made in picking generals. I believe that the usual view of why some so-called ‘political’ generals were chosen is incomplete or misguided. While there was a political element to all the selections, there was also a level of military consideration in the selection of some civilians to be generals. Lincoln’s initial action to suppress the rebellion was to call for the States to furnish 75,000 militia. But it was apparent that this would be insufficient. The service of the militia would be short lived — 90 days — and they owed their organization and leadership to the state governors. Lincoln needed a longer-lived federal force to continue the fight. His military advisors — Secretary of War Simon Cameron and head of the army General Winfield Scott — provided him with a plan to expand the regular army and create a volunteer army. In order to command these forces, Lincoln had to pick some generals. One challenge was a shortage of commanders who had led large formations of men. With the exception of Scott or Wool, the officers of the regular army had commanded no more than a regiment and often no more than a company. Lincoln needed generals to command much larger forces. In addition, the Volunteer Army would be composed of civilians serving for a term before returning to civilian life, a subtle but significant difference from commanding men enlisted in the regular army. Who would Lincoln know of that was available and had recent experience managing and directing a force of civilian soldiers several thousand strong? In addition to pondering this question, I have also recently been browsing civil war era newspapers and magazines. In a time when photography was in its infancy, the illustrator had an important role in publishing. Famous illustrators such as Thomas Nast and Winslow Homer got their start before the war working for magazines like Harpers Weekly, which was the most widely read periodical in the United States. 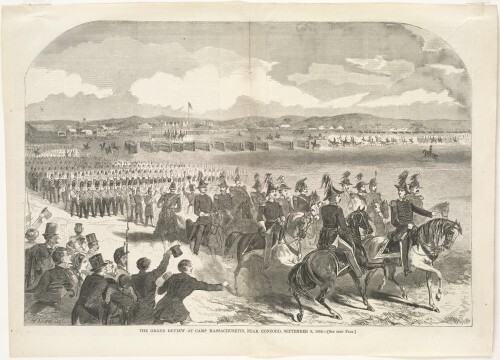 Below is an example of Homer’s work that appeared in the September 24, 1859 Harper’s Weekly titled ‘The Grand Review at Camp Massachusetts, Near Concord, September 9, 1859’. Two of Lincoln’s first choices for volunteer generals are in that image (as is one of his senior regular army generals).